Meeting space and news section of the Edgeryders webhome. Introduce yourself, discuss, find event announcements, read updates from the community. Happy reading, sharing and connecting! First, create a new topic here and let your fellow Edgeryders know a little about yourself. Tell us what you want us to know about you, and what will attract support from other changemakers here. Second, read what others have shared and leave a comment to offer some useful advice or help – or to just say hello. Just having somebody who listens and asks the right questions can unlock new, interesting thoughts that help us to move forward! We are on a journey to help one another to find the right ways to navigate the changes that are happening in Europe. How are we building good lives against a backdrop of massive social, economic, political challenges? How are we creating opportunities for ourselves and where can we support one another better? In work, health, family, community life. We build a meaningful, productive and enjoyable work-and-life environment. It combines business incubation, P2P learning and communal spaces. It is a new and affordable path to “the good life”, and we develop this collaboratively. Welcome to join! Our focus is on the Southern Mediterranean region right now, but you’re invited to become a part of this wherever you are. Take the challenge to shape your future work and life with peers around the world! Share networks, skills, and technologies to build the practical means for good lives. Learn how to create what we need from what we have. Work with an international network to develop your own project and make it more sustainable through open knowledge and technologies. Experiment with different ways of living together and generating income through meaningful projects and ventures. Learn new skills by building new things with others in the OpenVillage! The Open Village is a connected network of houses that shares a community platform, activities and economic opportunities. We collaborate in a free and open way on groundbreaking projects for prosperous lives full of meaning, love and mutual respect. If you come to us you will learn how to make a pirate radio in the form of a mesh network. Learn how to make spirulina and other kinds of bacterial growth. Learn how to make wine/beer, learn how to protect your web identity, encryption, build your own microscop, search for tardigrade, grow bacterias and bio ink, Mushrrom mycelium structures, create jewelry, beat making, film making, theatre, bread, cook, design clothes, create toothpaste/soap, sun screen, and also if the product really protects you, learn how to create philosophical analysis, critics, create your own micro business etc. We are building our own openvillage; this openvillage is a network of distributed open houses throughout the globe. Some of us are already living and working in such a space in Brussels, called The Reef. Now we are setting up a new space in the MENA region. You have the chance to design and build a community spot for MENA youth, the Reef MENA, to collaborate freely on groundbreaking projects in the quest for lives full of meaning, love and mutual respect. A ticket to Edgeryders Festival in Brussels (19-21 October 2017) where we design the OpenVillage. At the festival you will be part of a team training on community building and digital security tailored for regional dynamics. A ticket to the MENA community camp in December (26-30). A project residency in the Reef- MENA, in November, the exact location to be announced soon. The residency consists of an online and co-working/ co-living space for your project, where you will prototype and test results, as well as model it for future sustainability. Fellows are expected to actively engage with people from their countries online and offline, write about their own projects or other projects that they see valuable, conduct interviews, and on-board people on the platform. To start please write an in-depth post about a project you are working on, or a project that you see valuable ( you can interview the people working on it ) and leave thoughtful comments on the other stories. We look forward to get to know you as a potential fellow or a participant. How can a “smart swarm” come together to provide open, inclusive and sustainable solutions to supply the material and social components of a good life to every community across the globe? One of the most urgent problems facing us now is how to provide sustainable health and social care across the globe. We believe that the solution is an integrated network of local care services equipped with open source knowledge and technology. Because we know that diversity is critical, we volunteer to coordinate a “smart swarm” decentralised application of hundreds of small communities and organisations: and we invite you to join it. In August we will hold virtual gatherings where people can present their projects, which will be posted on our platform for the community to discuss. In September we will meet in person to shape our project proposals, circulate them for feedback from the community and create a final version. In November, we will collaboratively develop project proposals so that they they have reached a point where we can prototype some key ideas during a month of hands on building in the Mena OpenVillage Camp. In December the international community gathers in a beautiful location by the sea to evaluate one another’s prototypes and work on each others projects so that they meet a clear goal to help move them forward and co-design the next phase of our journey together. We end with a party to kick in the new year in style. On the online platform - Get honest critique and valuable information to boost the quality and relevance of your ideas. At the collaboration workshop - Discover inspiring local projects and potential partners. Follow a guided process to develop strategic collaborations. In the project development house by the sea - Prototype new ideas with skilled peers and shape a plan to generate income from them. At the international camp - Showcase your work to potential supporters, access expertise from mentors, build media coverage. This initiative is a #nospectators space - the more each one of us puts into it, the more we all benefit out of it. All members are expected to contribute money, time or equipment/materials. This keeps the initiative independent and fully dedicated to serving the community. Create account on edgeryders.eu and write a little about yourself. Respond to other people’s comments. Let’s have a chat about what you like and have time to do. To get in touch come to the next video chat, drop into our shared workspace or email us at community@edgeryders.eu. OpenVillage is the Edgeryders vision of how we will affect change at a systems level. To achieve the changes we want to see in the world, we have to be creative not only in creating new artefacts, but also in how we relate to them. We need to be mission driven, and stay for long (Mazzucato). This initiative aims to develop sustainable, and hopefully profitable paths towards reaching our goal. The Edgeryders community and organisation are uniquely positioned to build it because of the track record of the people driving it. And the fact that we are already generating revenue, have zero debt and a thriving community of >4000 talented, committed people in 80+ countries. With your participation we can get there faster and better. Why three different names? Are they different projects? The OpenVillage is a comprehensive set of open tech solutions and collective action strung together by a common narrative. Edgeryders is a collective intelligence platform for building the OpenVillage. A live-work space where we experiment with different solutions and develop the non-technical competences needed to use them effectively. Instead of doing a 2 week prototype, we run as we live with it, and keep tweaking it over time until it works. The stuff that stays with us will be included in the openvillage. ICOs for real estate, Robots, smart clothing, furniture, new forms of organising, art. It will be sustainable because people need a place to live and organisations need a place to work - revenue will come from rent of residential spaces in a unique setting amenable to personal and professional development. A Business network consists of people and organisations who wish to be close to where the action is. Edgeryders is already a place to access and nurture a unique stream of open innovation. Hand-held echostethoscopes that cost a fraction of what is on the market. Cheap coffee bean sorting machines. Mechanical arms to rotate and increase yield from solar panels. New assistive and medical devices and open source insulin. As part of the business network you can interact with us, get news from the edge and be part of it even if you cannot live with us. These innovations are open source, and they are accessible, but their use is restricted by different licenses issued by the innovators. When an idea or product under development is of interest to commercial companies The Reef can broker a deal in which the innovator can give different additional rights of use with a contract. This protects both parties against abuses. The business model is the one employed by opencorporates.com and thenounproject.com - pay to wave right to be named as author and in the latter case, gain access to the original design file. An Annual Festival and series of events gathering the community building the openvillage and the business network around it. The festival happens not in an anonymous conference room, but in the live-work space located where the openvillage is being built. It presents the new knowledge, artefacts and ideas coming out of The Reef, draws more participants and grows the ecosystem. It acts as a heartbeat that gives a steady rhythm to the work of building the openvillage over 10 years, grows the community and celebrates the achievements that come out of it. We build it as a viable business with multiple sources of revenue. It makes sense to build the Reef as a new company because this enables us to capture, align and channel all the externalities generated by the live-work space, business network and festival towards growing and strengthening the venture. The model is infinitely scalable: our online platform, digitial technologies and scientifically rigorous methodology enable us to cost-effectively scale and the remote membership. We have a couple of ideas for non-extractive and ethically sound business models with opportunities for personal and professional development that draw a steady stream of talented individuals. And we will design an appropriate governance model that balances the needs of the community with that of the people who take personal responsibility and invest huge amounts of time that is needed to get the company up, and keep it running well. Our world-class community building and management expertise make The Reef a safe and welcoming space that draws and maintains the diversity required for deep innovation. If the model catches on people will show up at our doorstep and say this is great, how can I do it in location x? Then we can move in and franchise the venture complete with a populated online platform and activities (which is the hardest thing to do- almost no one manages to get this right). Clients can pay us to help them set up their own Reef around a specific field e.g. healthcare. A person with a great network approaches us saying “I really want to build one of these in my city”; “we say great! You’re hired!” And they manage the setting up of a new company owned by the Reef. This is already happening. It happened with the unMonastery -as soon as the Edgeryders community started exploring the idea, the city of Matera asked us to run, and paid for, the first prototype. The project gained unsolicited coverage from international and local media (The Nation, New York Times, Il Sole 24 ore, Wired Germany etc etc), speaking engagements at large public events etc. The World Bank has commissioned us to implement a version in the MENA region as a place based social innovation incubator. We envision a network of Reef localities in every city bound together by an online platform which acts as a collective intelligence engine and extends the reach and scale of the model. And we are on the way. The first one was set up in Brussels in March of 2017. A second locality is now under development and with your help, will be up and running in Morocco by 2018. The online platform is already up and running (you are on it right now) and populated by a thriving community that spans the globe. By joining us early in the game you get a unique opportunity to shape your own involvement and the company as a whole. We are designing a multiplicity of ways to participate at different levels of commitment- from accessing newsletters all the way to partnering with us around new ventures e.g. large R&D projects which generate new commercial opportunities e.g OpenCare. Where are we are going with this? A future to look forward to, collaborating freely in the quest for prosperous, lives full of meaning, love and respect in tight knit yet open groups. It’s not about becoming reclusive tribes, nor is it about rejecting technology. We want to connect with one another, and with the world at large. To be well with ourselves and with one another. To thrive when failing institutions or existing large-scale centralised means of securing a good life no longer can be relied on. How will we get there? We have a long-term map of different components needed in a good life. For most of us, accessing several of them through existing means is difficult or impossible. At least if you look to what is available in the mainstream where power and resources are concentrated. You need to venture out to the edges where people are experimenting with all kinds of solutions for building thriving individuals, communities and societies. So we look for open source solutions and replicable efforts to satisfy our needs and work to make them accessible to a more people. On the new online platform we reach out to and connect people working on current issues and encourage them to share their stories, leave thoughtful reflections on the stories of others’ and respond to others’ comments on their own. We use community management and software to transform thousands of conversations into shared knowledge and concepts for how participants’ existing work can be connected to achieve impact at scale. Knowledge gained from hands-on practical experiences is transformed into wisdom powered by Collective Intelligence. Which themes and topics will you cover? We have a map of all the components of a well-functioning life and community based on consultation with people in over 200 cities. We convene conversations around one priority to focus enough energy and resources to move beyond talking. Right now it’s how we sustainably care for one another’s health: physical, social, mental and emotional. How can I bring this to my own community or geographic location? We support members to host events in different locations where participants meet in person, get to know one another and build big exciting ideas around which collaborate. People who participate in this process gain access to valuable information, new perspectives, and a huge network of contacts who can help unlock new opportunities for them. They understand where there are efficiencies to be gained, mistakes to avoid and skills to be developed. Individual changemakers use this collective intelligence to help them move their own efforts forward. Why should different people and organisations partner with this initiative? Allies have access to new initiatives as they are being born and can get involved at an early stage. Existing projects and their business/sustainability plan are documented in a standard format then posted on the community for further development. Participants are free to use and modify them under condition that attribution is given to everyone else who has contributed to its development so far, and that they have contributed something time or money to the project. How can I meet and get involved in the global community? You can participate in our annual community gathering that is build by community members, for community members. The objective of these events is to 1) build a holistic, shared understanding of the topic at hand 2) demo a credible systems level solution made of interoperable, smaller scale projects 3) use the evidence-backed vision and impact strategy to generate backing (attention, skills and time) for participants’ projects. How can people deploy and maintain their own OpenVillage house? Participants will collaboratively deploy one instance of each selected project within the Reef to serve as collective learning opportunity and demo of what is possible. We then support those who participated in setting up the first instance, to do the same in their own local context. Why Edgeryders? What sets Edgeryders apart is that we actually have the tools, methodology and organisational capacity to turn the participants’ “talking” into collective intelligence and action. I want to be a part of this, but I already have a demanding project which I don’t want to give up- is there some way I can participate anyway? The process is structured in a way that doesn’t require participants to give up what they are already doing or join someone else’s project. It is designed to work both for people who wish to work on location, as well as those who wish to participate remotely. The not for profit organisation stewarding the process uses revenue from commercial work to finance the long-term coordination work needed to make this all possible. How can I support this initiative? Come talk to us so we can pick a task that works for you. If you prefer to contribute money to help offset costs you can talk to us about how we can do this without compromising the integrity of this community driven initiative. الوجهة: مستقبل نتطلع إليه، نتعاون فيه بحرية، من أجل حياة مزدهرة لنا معنا، ومليئة بالحب والاحترام المتبادل داخل مجموعات مترابطة عن قرب. القرية المفتوحة هي مبادرة لا تهدف إلى بناء قبائل متوحدة، ولا إلى رفض التكنولوجيا. فمبادرتنا تهدف إلى التواصل مع بعضنا البعض، ومع العالم أجمع، في وئام مع أنفسنا ومع الآخرين، على طريق بنائنا لحياة كريمة قادرة على توظيف مواهبنا ومهاراتنا. الطريق: لدينا خارطة طويلة الأمد ذات مكونات ضرورية للحياة الكريمة. الكثير من تلك المكونات يصعب أو يستحيل على معظمنا الوصول إليها من خلال الوسائل التقليدية المتاحة. ومن هنا فأنت تحتاج إلى أن تستكشف طريقك خارج النطاق التقليدي، وبالقرب من تلك الفضاءات التي يجرب الآخرون فيها كل أنواع الأفكار من أجل تنمية الأفراد والمجتمعات بالتزامن. الوسيلة: اختر موضوع من الخارطة >> حدد التحديات المحيطة به >> اجمع معلومات عن المشروع >> نظم فعالية >> ضع هيكلا للوثائق والمعلومات >> جمع ردود الفعل >> أضف المشروع لمنصة القرية المفتوحة الاقتصادية كحل مقترح >> ضع نموذج تعاوني للبناء والإنتاج الفعلي على الأرض فى موقع القرية المفتوحة >> احتفل >> كرر نفس العملية إلى أن تتم تغطية كافة المتطلبات. ما نقوم به على المنصة الإلكترونية الخاصة بمبادرة القرية المفتوحة هو التواصل مع آخرين يعملون حاليا على يعضا من القضايا والأفكار ، نشجعهم على مشاركة خبراتهم، وترك انطباعاتهم المفصلة عن خبرات الآخرين، ثم الرد على تلك الانطباعات. ومن أجل هذا الغرض نستخدم برمجيات إدارة المجتمعات بغرض تحويل آلاف المناقشات إلى “معرفة ومفاهيم” يتم مشاركتها مع الآخرين من أجل إيجاد تأثير فعلي. وهنا يتم تحويل المعرفة المباشرة التي تم تحصيلها إلى خبرات مدعومة بما يسمى بالذكاء الجمعى. وفي كل مرة نقوم بذلك نختار موضوعا واحدا للنقاش حسب أولوياته الملحة. فالآن على سبيل المثال أولويتنا هي مناقشة كيفية الاهتمام بصحة بعضنا بعضا بصورة مستدامة على المستوى الجسدي والعقلي والنفسي. نقوم أيضا في مبادرتنا بمساعدة الأعضاء على تنظيم فعاليات في أماكن مختلفة يتقابل فيها المشاركون وجها لوجه، يتعرفون على بعضهم البعض، ويبنون سويا أفكارا كبيرة ومثيرة يتعاونون معا على تحقيقها. وهنا يتاح لهؤلاء المشاركين في تلك العملية معلومات قيمة، ورؤى جديدة، إضافة إلى تلك الشبكة العملاقة من الأفراد الذين يمكنهم فتح الباب أمام فرص جديدة. وهكذا يصبح باستطاعتهم تحديد نقاط النجاح وكيفية الوصول إليها، وتجنب الأخطاء، وكذلك الوقوف على المهارات التي يمكن تنميتها. إضافة إلى ما سبق، نقوم في المبادرة أيضا بالتعاون على بناء برنامجا للمقابلات والإقامات الصغيرة في أماكن مختلفة من العالم. والهدف من تلك الفعاليات هو أولا: بناء ومشاركة فهم شامل للموضوع الجارية مناقشته، ثانيا: تكوين نموذجا تجريبيا فاعلا للأفكار المرتبطة بذات الموضوع، شريطة أن يكون قابلا للتطبيق على مستوى مصغرا، وثالثا: اتباع استراتيجية ذات رؤية وتأثير، وتكون كذلك مدعومة بالأدلة العملية التي تهدف إلى دعم مشاريع المشاركين الآخرين. وأخيرا وليس آخرا، تأتي مرحلة الإطلاق والمتابعة. وهنا يقوم أعضاء المجموعة بإطلاق أحد المشروعات المختارة داخل إطار القرية المفتوحة بصورة تعاونية فيما بينهم، كنوع من الخبرة التعليمية الجماعية و نموذج تجريبي لما يمكن تحقيقه. وهنا يأتي دورنا مرة أخرى كمبادرة في دعم هؤلاء الذين شاركوا في بناء النموذج الأول، ومعاونتهم على عمل نفس الشيئ على نطاق أوسع في محيطهم المحلي. إن قريتنا المفتوحة من خلال تعاونها مع منظومة إدجرايدرز، يتوفر لديها الأدوات المنهجية والتنظيم القادر على تحويل “دردشتنا” إلى ذكاء جماعي. وقد تم تنظيم تلك العملية بصورة لا تتطلب من المشاركين أن يتخلوا عن أعمالهم مسبقا، ولا أن يكونوا مضطرين للمشاركة في مشروع شخص آخر. فالمبادرة مبنية على أساس يوفر مرونة كافية تناسب هؤلاء الذين يرغبون في العمل بموقع فعلي محدد، جنبا إلى جنب مع أولئك الذين يفضلون العمل عن بعد. وهنا يتلخص دور منظمتنا الغير هادفة للربح في الإشراف على تلك العملية، مستثمرين العائدات التي نجنيها من الأعمال الربحية الأخرى في تمويل خطة قريتنا المفتوحة التعاونية طويلة الأمد من أجل جعل كل ذلك ممكنا. كيفية الوصول للهدف وكيفية المشاركة: هنالك عددا من التحديات “الثابتة” التي ستواجهك من البداية. عندها نبدأ بطرح السؤال عن ماهية الصورة المثالية لما نهدف إليه (كيف تبدو الحياة في القرية المفتوحة؟) وهنا نقوم بعكس اتجاه السؤال، كيف حدث ذلك؟ ما الذي سبقه ؟ وما الذي كان قبل ما سبقه؟ … كل ذلك يتحول إلى علامات على الطريق الذي تتشكل فيه التحديات التي نواجهها، وهو الطريق ذاته الذي يتشكل على جنباته مجتمع في حالة مستمرة من التقدم. إنه مثل كتابة قصتنا في المستقبل … لكن بصورة عكسية. Where we are going: A future to look forward to, collaborating freely in the quest for prosperous, lives full of meaning, love and respect in tight knit groups. It’s not about becoming reclusive tribes, nor is it about rejecting technology. We want to connect with one another, and with the world at large. To be well with ourselves and with one another. To thrive when failing institutions or existing large-scale centralised means of securing a good life no longer can be relied on. How we get there: We have a long-term map of different components needed in a good life. For most of us, accessing several of them through existing means is difficult or impossible. At least if you look to what is available in the mainstream where power and resources are concentrated. You need to venture out to the edges where people are experimenting with all kinds of solutions for building thriving individuals, communities and societies. We convene conversations around one priority area at a time. Right now it’s how we sustainably care for one another’s health: physical, mental and emotional. 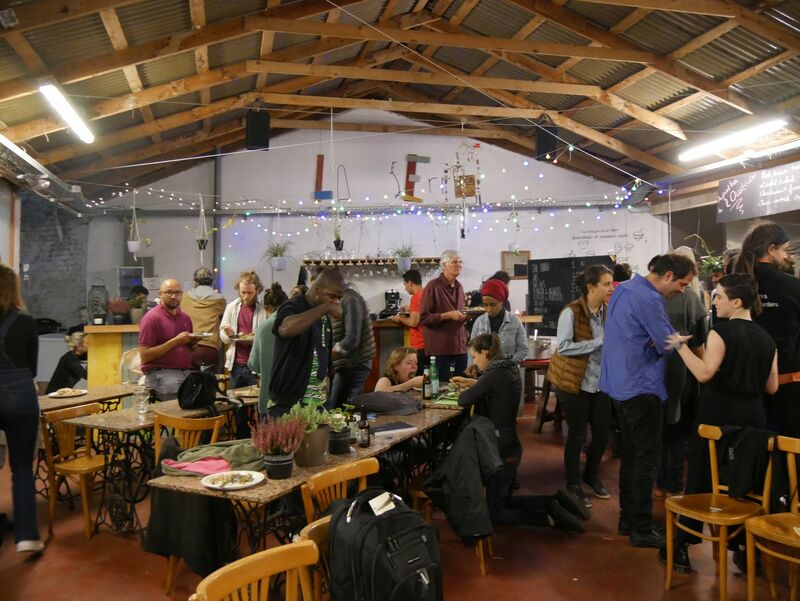 We support members to host events in different locations where participants meet in person, get to know one another and build big exciting ideas around which collaborate. People who participate in this process gain access to valuable information, new perspectives, and a huge network of contacts who can help unlock new opportunities for them. They understand where there are efficiencies to be gained, mistakes to avoid and skills to be developed. Individual changemakers use this collective intelligence to help them move their own efforts forward. Allies have access to new initiatives as they are being born and can get involved at an early stage. Existing projects and their business/sustainability plan are documented in a standard format then posted on the community for further development. Participants are free to use and modify them under condition that attribution is given to everyone else who has contributed to its development so far, and that they have contributed something time or money to the project. We collaboratively build an annual Festival. The objective of these events is to 1) build a hollistic, shared understanding of the topic at hand 2) demo a credible systems level solution made of interoperable, smaller scale projects 3) use the evidence-backed vision and impact strategy to generate backing (attention, skills and time) for participant’s projects. Deployment and maintenance. Participants will collaboratively deploy one instance of each selected project within our own open village to serve as collective learning opportunity and demo of what is possible. We then support those who participated in setting up the first instance, to do the same in their own local context. What sets Edgeryders apart is that we actually have the tools, methodology and organisational capacity to turn the participants’s “talking” into collective intelligence and action. The process is structured in a way that doesn’t require participants to give up what they are already doing or "join someone else’s project. It is designed to work both for people who wish to work on location, as well as those who wish to participate remotely. The not for profit organisation stewarding the process uses revenue from commercial work to finance the long-term coordination work needed to make this all possible. How we are getting there and how one can contribute: a number of challenges that are “constant”, and what you see on arrival. We start with what our ideal situation is (how life is in the open village) and then reverse engineer it. How did that happen? What came before that? And before that? These become our milestones around which the challenges are shaped and a growing community convened. Writing our shared story in the the future, backwards. Une initiative pour promouvoir la jeunesse et l’employabilité en Moyen-Orient et en Afrique du nord . Notre destination (ou allons-nous ?) : Vers un avenir qu’on contemple ensemble. Un avenir dans lequel nous collaborant librement dans la quête de prospérité, d’une vie pleine de sens, d’amour et de respect mutuel au sein de nos communautés interconnectés. Il ne s’agit pas de devenir des tribus restreintes, ni de rejeter la technologie. Bien au contraire ,Nous voulons nous connecter les uns avec les autres et avec le monde entier. Un échange en toute harmonie avec soi et avec autrui pour la création d’une vie digne ou on est capable d’exploiter nos talents et nos compétences. Notre chemin (Comment y parvenir) : Nous avons dressé une longue liste avec les éléments essentiels pour assurer une vie digne. Mais il nous est difficile, voire impossible d’aboutir à un résultat avec les moyens traditionnels qui sont à notre disposition . La solution réside dans l’innovation : Éloignons nous des idées galvaudées sortons des sentiers battus optons pour un nouvel esprit qui nous permettra de faire évoluer les individus, les communautés et les sociétés simultanément. Sur la plateforme électronique du village ouvert, nous communiquons avec des personnes qui militent pour des causes et des idées d’actualité. Nous les encourageons à partager avec nous leurs histoires et à laisser des réflexions sur les histoires des autres et ou à répondre aux commentaires des autres . Pour se faire nous utilisons la gestion communautaire et les logiciels pour convertir des milliers de discussions en connaissances et concepts qui seront partagés avec d’autres personnes afin d’atteindre un réel impact. C’est ainsi que nous transformons les connaissances recueillies en sagesse alimentée par ce qu’on appelle l’Intelligence Collective. Par exemple notre priorité en ce moment est la façon dont on peut améliorer la santé de l’homme de manière durable sur le plan physique mental et psychologique. Les membres participants auront accès à de précieuses informations pourront découvrir, de nouvelles perspectives, en plus d’un énorme réseau de contacts des personnes qui peuvent leur offrir des opportunités. Ainsi, ils seront en mesure de cerner les facteurs clés de la réussite et la manière d’y parvenir tout en évitant les erreurs. Ils pourront de la sorte se focaliser sur les compétences qu’ils peuvent développer. Les alliés ont accès, également, à la plateforme à mesure qu’ils portent des initiatives et peuvent s’impliquer dans des projets à un stade précoce. Les projets existants et leurs plans commercial / développement durable sont documentés dans un format standard puis partagés auprès de la communauté pour le développement ultérieurement. Les participants sont libres d’utiliser et de les modifier sous condition que l’attribution soit donnée à tous ceux qui ont contribué à son développement jusqu’à présent, s’ils se sont investis en temps ou en argent pour développer le projet . Démontrer la crédibilité des solutions que nous proposons à une petite échelle. Utiliser la stratégie de vision et d'impact soutenue par des preuves pour générer un soutien (L’attention, les compétences et le temps) pour les projets des participants. Les participants collaborent sur un projet sélectionné dans le village ouvert , ce projet sera une opportunité d’apprentissage collectif et de démonstration de ce qui est possible. Nous soutenons ensuite ceux qui ont participé à la conception et la mise en place des premières actions, pour dupliquer ses actions dans leur contexte local. Ce qui distingue Edgeryders, c’est que nous détenons de réels outils, de la méthodologie et de la capacité organisationnelle pour transformer la «conversation» des participants en intelligence et en action collective. Le processus est structuré d’une manière que les participants n’aient pas à renoncer à leurs travaux à l’avance ou à être obligé de participer au projet de quelqu’un d’autre. Notre initiative adopte une méthode de travail flexible dans le but de permettre à ceux sont dans un lieu physique spécifique de travailler côte à côte avec ceux qui préfèrent travailler à distance. Le rôle de notre organisation à but non lucratif se résume à la supervision de cette opération et à l’investissement des revenus récoltés des autres travaux lucratifs pour avoir la capacité de financer le plan de notre village ouvert à long terme. Comment arrivons-nous à notre destination et comment participer ? , c’est-à-dire (Comment devrait être la vie au sein du village ouvert) Ensuite nous inversons l’orientation de la question « Comment ceci est arrivé ?» « Et qu’est ce qu’il y’a eu avant ce qu’il a précédé » Tout ceci se transforme en des marques sur le chemin sur lequel se forment les défis qu’on s’est lancés. Un chemin qu’on construit en même temps de construire une société dans un état constant de développement. The Research Network is a business unit in the Edgeryders company, organised as a network. After preliminary discussions with community members, we started its buildup in October 2017. A development lab within Edgeryders to build experimental software and methodology for decentralized organizations and co-created culture. Connecting artists, producers, researchers who use culture as a tool for social change. We do community building and conversations, research, cultural interventions (urban games), and participatory community events. This is our open team coordination space. Introduce yourself below! unMonastery Matera (Italy): helping the city of Matera win the European Capital of Culture 2019. Georgia’s Futurespotters (Georgia): helping UNDP country office reach out to innovators on the ground. Spot the Future Bucharest (Romania): helping the city of Bucharest bid for European Capital of Culture 2021. Network building for Galway 2020 (Ireland): helping the city of Galway win European Capital of Culture 2020. This Internet of Humans category, part of the NGI Forward Initiative, is publicly available, but is not yet publicly launched. That happens in May. If you want to start a new topic, select the subcategory that is most appropriate for the subject of your topic from the dropdown menu below where you enter a title. For example, if it is your own story, then Tell Your Story is the correct location. The comment threads in the topics are “nested,” which means you should choose to reply to a specific comment in most cases (the ‘reply’ at the bottom right of the comment), rather than reply to the whole topic (the blue ‘reply’ button at the bottom of the topic). How to use our website, be part of our community and work with our company. Your question is not answered? Just ask in the documentation topic where it should be answered. We’ll then improve the documentation wiki for you. Note: Some workspaces belong to finished projects, marked in gray. You can still comment there, but no longer create topics.